All this while, HMI group announced its result in semi-annual basic. Little did I know that when its market capitalization exceed SGD75 million, the group need to report its result in quarter basic in accordance to SGX rules. So, I was little bit late to read its latest 3rd quarter report. HMI group posted a better quarter result at the top line as well as at PBT level. 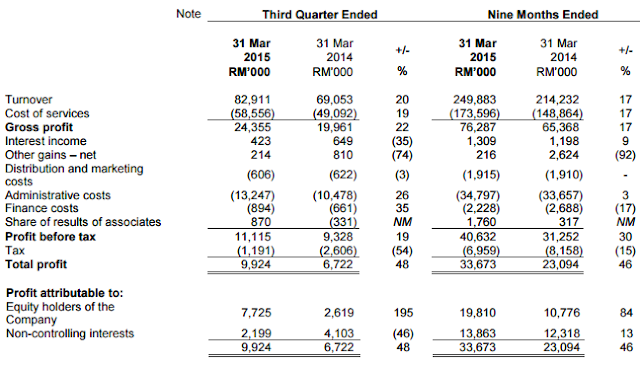 Gross margin and PBT margin also improved. Profit attributed to the shareholders jumped much more, probably due to higher contribution from its Regency Specialist Hospital which the group's ownership is higher compared to Mahkota Medical Centre. Tax expense was lower due to due to the reversal of deferred tax liabilities upon the completion of the exercise to restore the Group’s ownership of certain hospital assets previously transferred to associated companies. The group's net profit attributed to the shareholders was only RM16 million for FY14 but the group already able to chalk up an impressive RM19 million with one more quarter to spare. FY15 will be another good growth year for the group. The group managed to pare down its borrowings by around RM15.7 million. To make it better, the group done it with increased cash on hands. 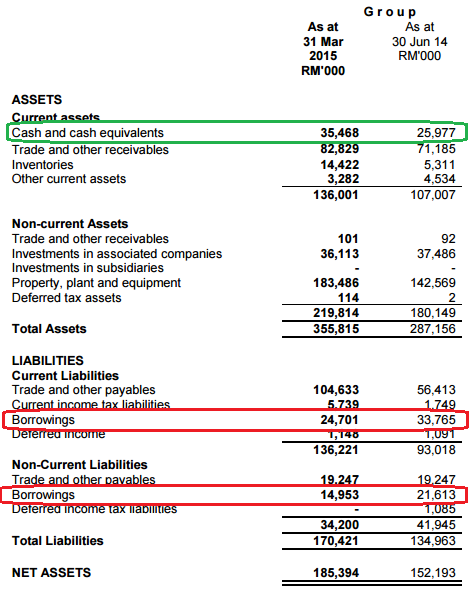 The group net borrowing of RM29.4 million as at June 2014 was improved to net borrowing of RM4.2 million. Foresee the group's finance cost will be lower moving forward. The reduce in loan was due to its strong operating cash flow as well as its asset restructuring which resulted in higher trade payables. The group used the spare cash to pare down its loan and purchase new PPE as seen at the cash flow statement. From the statement, the directors are cautiously optimistic that the group will continue to perform well for the rest of the year even though the group pointed out that new hospitals are coming in to compete at the two states the group's hospitals are operating at. Elsewhere in the statement, the group also mentioned they has received non-binding expressions of interest for MMCSB and has not made any definitive decision with respect to the potential sale of MMCSB. However, there was an article in the news media stated that the group intend to invest about RM200 million to build a new 500-bed hospital block on a parcel of land adjacent to existing Mahkota Medical Centre Melaka. And its IR officer stated clearly that they would not answer any questions through emails or phone call. Just attend their AGM. So, just continue to hold and see what will happen later.